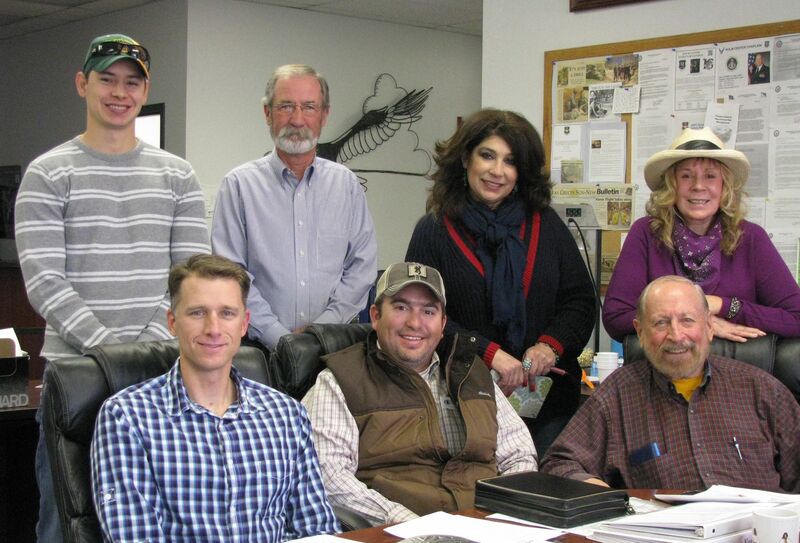 In January, 2015, four new members were welcomed to the FASF Board of Trustees: Roy Mantei; Alma Villezcas; Bill Wallace III and Megan Wenzel. These four new Trustees join sitting Trustees Col. Ira Cline; Ric Lambart, Dr. Kathleen Martin and Josh Plasencio. The FASF Board of Trustees customarily has nine Trustees. Last year the Board voted to dedicate a position on the FASF Board to a University level ROTC cadet. By allocating this Trustee position to a cadet, the Board sought to engage a new generation of leaders with the Foundation. The presence on the Board of Trustees of Alma Villezcas and Bill Wallace brings a true cross border, international experience to the FASF. Both Trustees Villezcas and Wallace (as well as Trustee Kathleen Martin) have long standing ties to Mexico. The FASF welcomes these trans-border links as the history of the First Aero Squadron has long transcended the American-Mexican border. After all, the Jennies of the Pershing Punitive Expedition flew communications, surveillance and reconnaissance missions over both sides of the border. Interestingly the famous U.S. Army Buffalo Soldier’s 13th Calvary was garrisoned at Hacienda Corralitos, the ancestral family ranch and current Mexican home of Trustee Bill Wallace. All four of the new Trustees have extensive business experience. Trustee Alma Villezcas manages the most successful convenience market in Deming which features a gas station and car wash in addition to the market itself. A new restaurant was recently opened as part of the complex. 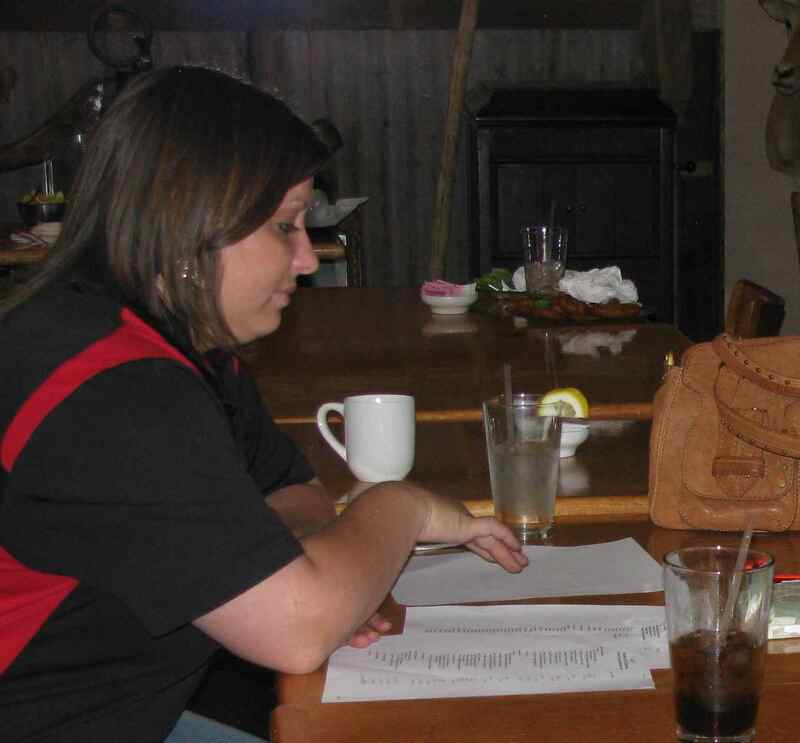 Trustee Megan Wenzel manages a busy automotive repair franchise on Deming’s main street. Trustee Roy Mantei has extensive experience in industrial management particularly in aerospace manufacturing. Trustee Bill Wallace is the manager of one of the largest stockyard operations along the USA-Mexico border. In the coming year the FASF will be participating in various public events. We hope that FASF members will attend and get to know these four new Trustees. Roy Mantei – I joined the FASF to occupy some newly-retired time in the service of two favored subjects, history and airplanes, and was offered the opportunity to stand for election to the Board to “really get involved”. With the Centennial Celebration coming up in less than a year, it seemed that there would be plenty to do, and I eagerly agreed to volunteer for the Board of Trustees . . .
As promised, there’s LOTS to accomplish in the next year, and I’m anxious to make real progress towards the FASF Centennial Celebration goals with the help of all present and past Board members. We’ve got a BUNCH of bright, committed, aviation/history-centered FASF members, and I invite all of them to help the Board make Raid Day 2016 a very special event to honor the men who rocked the cradle of aviation in Columbus. Alma Villezcas – I love being part of a group that is almost starting from scratch. I know I can bring so much to the table based on my experience and knowledge. When I see progress like the FASF has made, I feel that I have helped accomplish something good. I am eager to see us expand and eventually set up the FASF museum. Bill Wallace – I am looking forward to helping plan and be a part of the 2016 Centennial celebration. I an involved in international commerce and can be helpful in working with Mexico as the FASF organizes for the Centennial. Some of the events during the Mexican Revolution (which began in 1910), and specifically the 1916 event in Columbus, took place on the Corralitos Ranch which has been in my family since the late 1800s. Villa’s men camped on our land and used some of our horses when they traveled north to the border. The “Pershing Highway” runs right through our ranch, located 25 miles north of Casas Grandes, Mexico. I know a lot of ranchers and their families who were affected by the Mexican Revolution and eventually moved to Deming or Columbus. I will enjoy helping people understand more about the Raid and its impact on our two cultures. Megan Wenzel – I have enjoyed being on this Board and I am learning about a whole different world. One of the reasons I ran for the FASF Board was to be more involved with this community and I am willing to help develop the FASF in any way I can. Col. Ira Kline – Being a member of the FASF is a wonderful opportunity to keep a critical part of our Air Force heritage and history alive. It’s amazing to consider how the birthplace of America’s forward-deployed air superiority began in the little old outpost of Columbus, New Mexico. The lessons learned during that operation in Columbus set the stage for the unprecedented capability we know today. The FASF is under new leadership with a focus on significantly improving operational transparency that frankly did not exist in prior years. Josh Plasencio – I joined the FASF initially to get involved in the community and help out any way I can. I see the FASF as a very worthwhile cause and hope to be part of the push that will make the foundation successful in completing the many goals it was created to accomplish. Finish Line in Sight . . . . . . . . . . . . We’re Almost There! Greetings from our Treasurer’s desk! Alma Villezcas was born in Casas Grandes Mexico The first foreign U.S. Airbase. Alma Villezcas (at left), FASF Treasurer, reports that we’re almost there. The highly successful “Buy an Acre” campaign launched last year has already gone well past the half way point, enabling us to purchase the first 80 acres of the two 80 acre parcel that constitutes the addition to our original 60 acre 1916 US Army Airfield, used by the First Aero Squadron. Once we’re over the top and have all of the 220 acres involved purchased and in the FASF’s name, we’ll start to work finishing the design and erecting the monument to those early airmen who flew from the First Aero Squadron’s Airfield here in Columbus. In addition to the Dedication Statement on the Shrine honoring those brave pilots who flew out of our Airfield 99 years ago, we will have every one of our “Buy an Acre” contributors, or their designees’ names, engraved on the impressive memorial structure. Every donor, their loved one’s names or those whom they wish to honor, will be a permanent part of this beautiful monument – a lasting memory to not only the First Aero’s pilots, but also to all those generous donors who helped us purchase and then preserve for posterity this historic airfield. Don’t forget – this is an exceptional bargain if there ever was one. Only $250 per acre right here in Columbus, New Mexico. Where else can you purchase an acre for such a small sum? For every $250 donated to this worthy cause, you or your designee’s name will be etched on the Memorial Monument for all to see in generations yet to come. Why not persuade your relatives and friends to take advantage of this once-in-a-lifetime opportunity, too? Isn’t it pretty hard to go wrong with this great a bargain, especially in this day and age? Please sit down right now if you haven’t yet taken advantage of this rare opportunity to memorialize not just those early pioneering Army Pilots of the First Aero Squadron, but your own remembrance or that of either a loved one, or someone else you’d like to also honor. If you’ve already contributed, why not contribute even more acres and honor more of your family, friends, living or posthumous heroes? Once the goal has been reached, the monument will be set, literally, in stone, and it will be forever too late to take advantage of this wonderful opportunity to memorialize yourself or others you wish to honor. FASF Aerodrome Staff captured this photo of Colonel Carey Wagen (Left), Commander of the U. S. Army’s 1st Armored Division’s Combat Air Brigade (“CAB”) during her presentation to a group of former Military Aviators in El Paso.. At right is Dr. Kathleen Martín, who discussed the upcoming Centennial of the Birth of American Air Power with the Colonel. 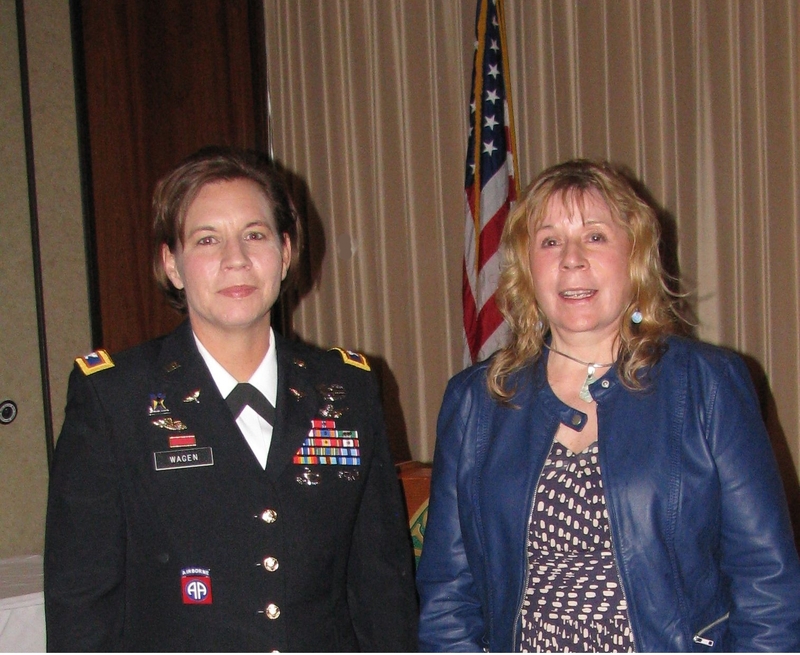 Colonel Wagen, was recently welcomed to her new command at Fort Bliss’ Bigg’s Army Airfield. A combat helicopter pilot, the Colonel is only the second woman to command a combat aviation brigade (CAB) in the history of the U. S. Army. Prior to taking command of Ft. Bliss’ CAB, she was the Deputy Director of Aviation operations for the Army Forces Command at Fort Bragg, N.C. Colonel Wagen deployed twice to Afghanistan and recently oversaw some of her Brigade’s operations in Africa, where they took care of logistics for the U. S. aid project to assist in the Ebola outbreak. In her private life, the Colonel is an enthusiastic aviator, as well, often flying her own family four place experimental canard winged “Velocity” aircraft with her husband, a retired Army aviator and their two young sons. Before coming to Fort Bliss, Col. Wagen commanded the 2nd Battalion, 82nd Combat Aviation Brigade. Previously, she served in leadership and staff positions all the way up to Battalion Commander at the 82nd Airborne Division Headquarters. The Colonel earned her Master’s Degree in strategic studies from the United States Army War College and is a graduate of the U.S. Army Command and General Staff College, as well. The Colonel obtained her officer’s commission in the Army after graduating as a Cadet in the Army ROTC program during her undergraduate years in Florida, her home state. Colonel Wagen’s awards and decorations include: the Bronze Star Medal (with Oak Leaf Cluster); Army Meritorious Service Medal (two Oak Leaf Clusters); Air Medal (Oak Leaf Cluster); Army Commendation Medal (three Oak Leaf Clusters), Army Achievement Medal (five Oak Leaf Clusters), Humanitarian Service Medal; NATO/ISAF Medal, Master Aviator Badge, Senior Parachutist Badge and Air Assault Badge. Our new Aerodrome Editor, July McClure, (above) practices her formatting and arranging skills on the newly donated large dual screen computer system. Prior to taking the helm of the “Aerodrome,” July worked as a photojournalist, primarily in the Southwest. For a number of years she served full-time as a reporter for the Deming Headlight. Occasionally, she still produces stories for them on a free-lance basis. 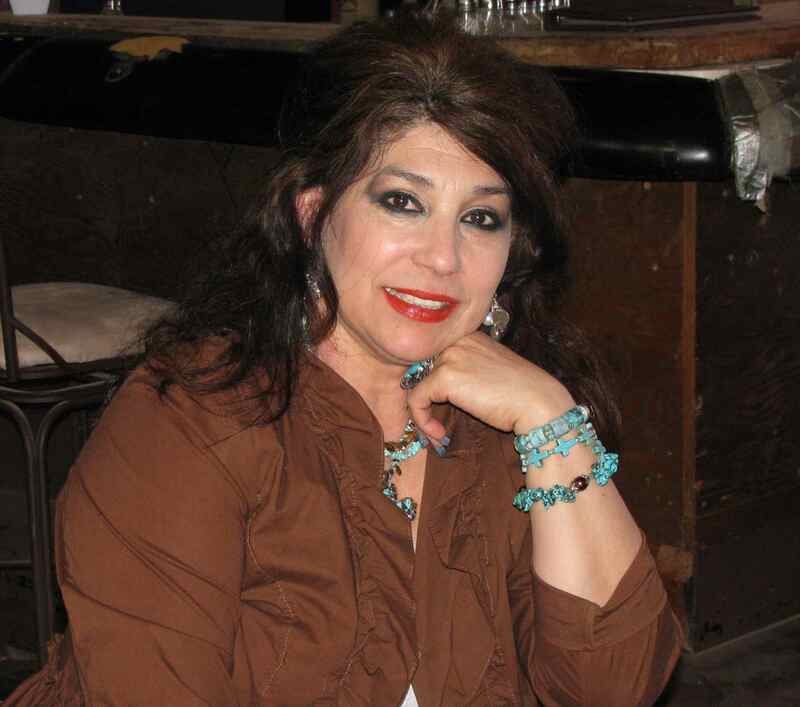 She also helped staff the specialty Southwestern NM magazine, “Desert Winds”. If you’d like to help us produce the Aerodrome, whether at the publishing and distribution end or by helping with the actual writing of its colorful pages, please contact July at: (575) 519-1100 and let her know how you’d like to help. We are honored to have General Cardenas as one of our earliest FASF advisors. 1941-1942 – Commissioned as 2nd Lt.; helped establish Army Air Corps Glider School in 29 Palms, CA. 1944 – Flew combat missions in B-24 “Liberators” over Germany. Shot down over Germany on his 20th mission, he parachuted to into the enemy’s territory, but was confronted with the necessity of escaping Nazi clutches while wounded and still seriously bleeding. His only way to freedom would be to swim across the frigid waters of Lake Constance, which lake was the border between neutral Switzerland and Nazi Germany. Only about 1/4 of the way towards Switzerland, the young wounded aviator began to drown in the cold water, notwithstanding his experience as a skilled swimmer. Fortunately for him, a Swiss Fisherman spotted the wounded pilot, pulled him to safety and brought him to Switzerland and safety. One wonders what might have happened to this escape story had the fisherman been German! 1945 – A test pilot after graduation from Flight Performance School in Vandalia, Ohio. Participated in flight test of German jet fighter ME-262 and the world’s first jet powered bomber, the German Arado 234. 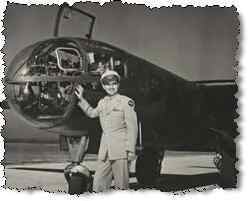 1947 – Was key member of the X-1 supersonic project; and command pilot of the B-29 that launched Capt. Charles Yeager into the realm of supersonic flight. 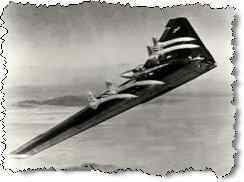 1948 – Chief Air Force test pilot on the YB-49 flying wing project. Checked out Captain Glen Edwards in the YB-49. He was ordered to the University of California to complete his Aero- nautical Engineering degree, then ordered back when Capt. Edwards and his crew were lost in the YB-49 crash. Helped complete Stability & Control testing of remaining YB-49 Flying Wing jet aircraft. His transcontinental non-stop flight in the YB-49 from Muroc AB to Andrews AFB in Washington for President Truman’s Air Show set a record time of 4 hours and 5 minutes. During the Korean War, tested new jet fighters and bombers at Wright Field and Edwards AFB. Was made Commander of the 51st Fighter Interceptor Wing at Naha AB on Okinawa. Returned to the States; was assigned to the Pentagon as Chief of the Aircraft and Missiles Program Division. 1962 – Led a joint Army & Air Force Special Force into Kashmir, India to improve resupply drops in the Himalayan Mountains. He used these techniques to equip forces and prevent an incursion of Chinese through the Himalayas into East Pakistan. Sent back to Okinawa as Commander of the 18th Tactical Fighter Wing at Kadena AFB. 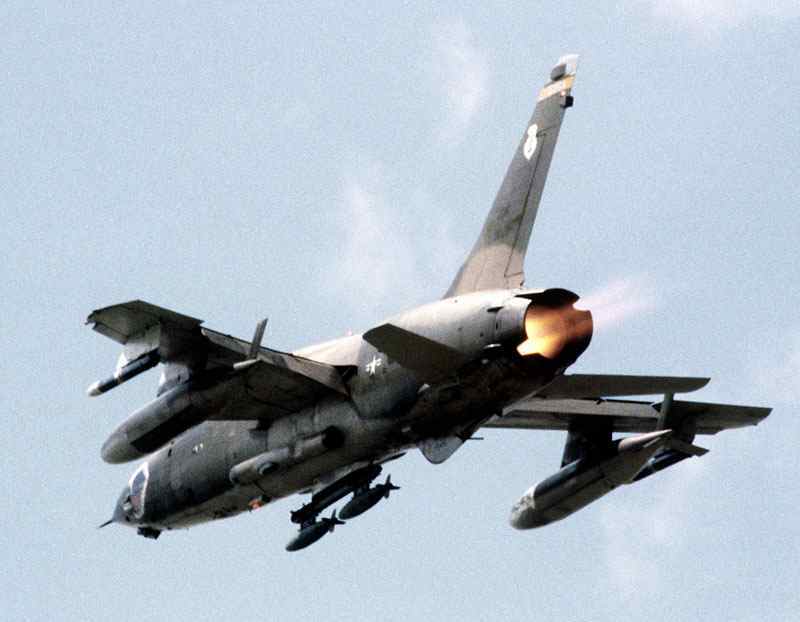 Flew F-105 Thunderchief (a supersonic jet fighter-bomber seen below) combat missions from Korat, Thailand, over North Vietnam after the Gulf of Tonkin crisis. Back in the U.S. he commanded the 835th Air Division at McConnell AFB, training F-105 jet fighter crews for combat in Vietnam. 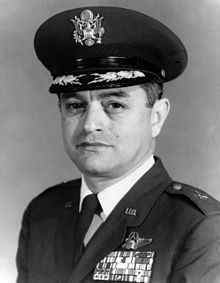 June, 1973 – Gen. Cardenas retired. As a division Chief of Joint Strategic Target Planning Staff (JSTPS) was responsible for development of the Joint Strategic Target List of the US nuclear War Plan (SIOP). Negotiated with Muammar Gaddafi for the withdrawal of US forces from Wheelus AFB, Libya as Vice Commander of 16th Air Force in Spain. 1983 – appointed California coordinator for President Reagan’s Southwest Boarder Economic Action Group. 1985 – appointed Chairman of Juvenile Justice and Delinquency Prevention Advisory Group and to California Council of Criminal Justice. 1993 – honored by Univ. of New Mexico Engineering College for his contributions and leadership. 1995 – Inducted into the “Aerospace Walk of Honor”, Lancaster, California. 2002 – Recognized for his contributions to the development of Special Forces and inducted in the Air Commando Hall of Fame. 2005 – awarded Sigma Chi’s “Significant Sig” medal at National Convention in Albuquerque, NM. General Cardenas has been awarded many honors including: the Distinguished Service Medal, Distinguished Flying Cross, Purple Heart, and Meritorious Service Medal. 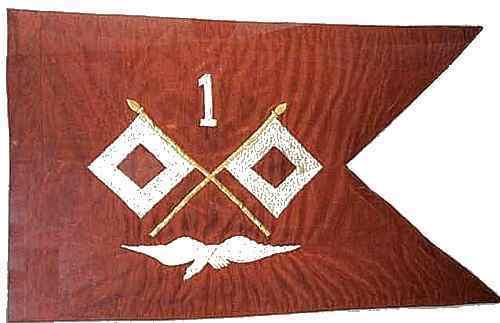 Foreign decorations include the Spanish Grand Legion of Aeronautical Merit with Sash & Dagger. Fellow FASF Advisor, John Deuble, reports that the General is a 2015 Honoree to be inducted into the National Aviation Hall of Fame this coming October! The General lives in San Diego, California with his wife Gladys and near their children and grandchildren. 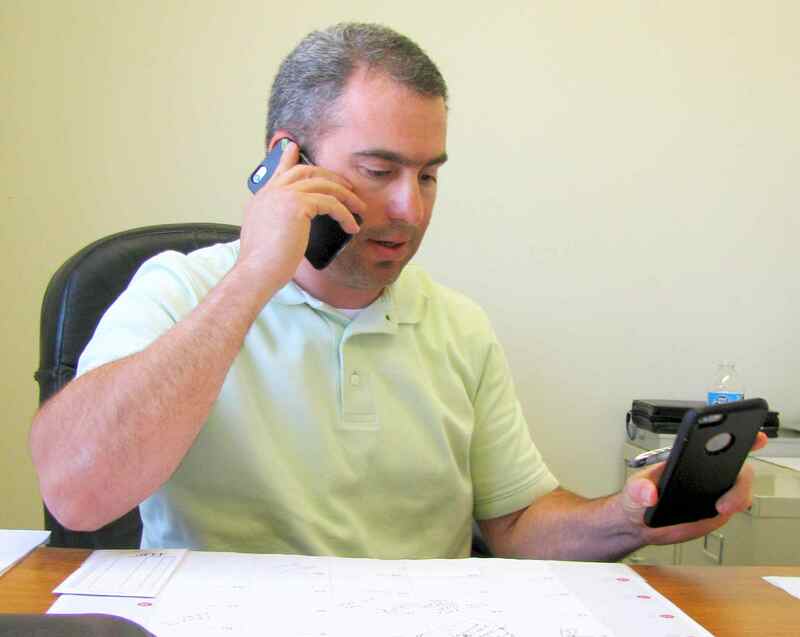 Trustee Bill Wallace at work, juggling two phones. Trustee Megan Wenzel studying Centennial proposals. Copyright 2015 © First Aero Squadron Foundation – Contents usable only with prior permission of the FASF. The FASF must be clearly referenced as the used content’s source.